The East Shore Internet Society would like to wish all our subscribers, volunteers and staff a Happy New Year and all the best for 2019! Towards the end of 2018 we were thrilled to receive a Best of Business award from Kootenay Business magazine. Way to go team! The Columbia Basin Trust recently posted this news release featuring a quote from ESIS subscriber and Gray Creek resident Michella Moss. The success of the Connecting Canadians Project has meant that more East Shore residents are able to work remotely from their homes. Improved broadband has enabled local businesses to market globally, it has also attracted new families to our community and allowed part-time residents to spend more time here. Snowbirds have returned to their East shore nests and seasonal businesses are open! Things are also getting busy at ESIS. Our new unlimited data service is HOT with more and more household subscribers choosing no data limits. ESIS is hosting two community events in early June: our Annual General Meeting (AGM) will be Monday evening June 11th, 7pm at the Crawford Bay Hall. At the AGM, members can be informed about the activities of the last year, and most importantly, have an opportunity to join the ESIS board as a director. Three current ESIS directors are stepping down this year, and we are looking forward to a year of positive changes and new project planning, which will need some new energy! With that in mind, ESIS is hosting a Town Hall presentation on Wed. June 6th, 6pm – 8pm at the Crawford Bay School. 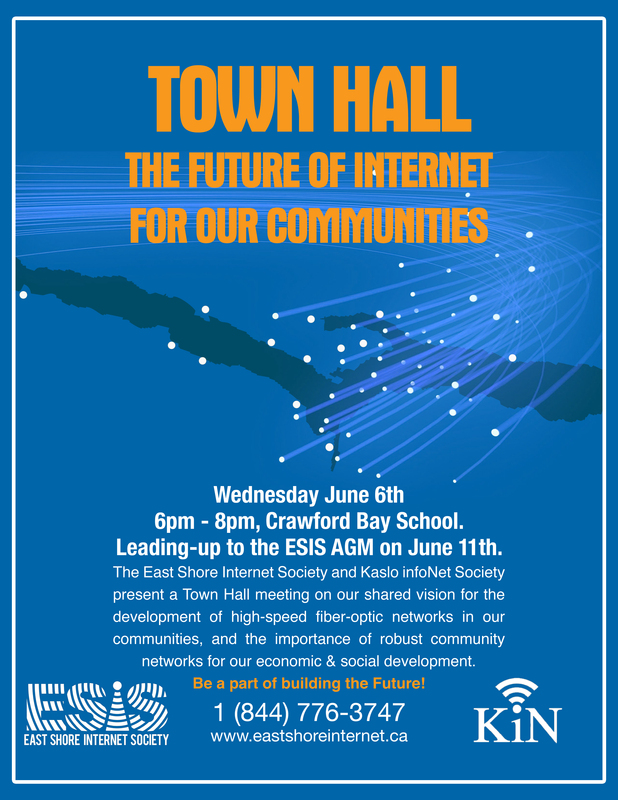 The presentation is about the future of internet for our communities, and will feature guest speakers from Kaslo’s infoNet Society who will share their experience developing a community-based high-speed fiber optic network, and why it’s so important for communities like ours to be able to develop and thrive in this way. If you’re interested in being a part of building the future, or just want to know what’s happening, we strongly encourage you to come to the Town Hall and AGM. See you then and have a great Summer! Warmly, the ESIS board and staff. 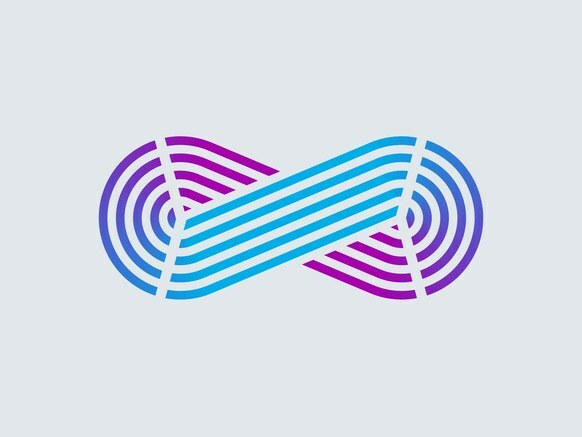 We are thrilled to announce that beginning April 1st, ESIS will be rolling-out a new service add-on: Unlimited Data! The cost will be $25 per month in addition to whichever ESIS package you may choose. Don’t worry about data overage charges a moment longer! Binge-watch that series without a care! For more information and to add Unlimited Data, please call ESIS at 1-844-776-3747 (PRO-ESIS), and press 3 for billing. Our 2018 Annual General Meeting is scheduled for Monday June 11th, 7pm at the Crawford Bay Hall. ESIS is looking for new board members, community members who are eager to participate in the ongoing growth and development of this crucial community enterprise. If you’re interested in becoming an ESIS director, please email board@eastshoreinternet.ca. We would also like to extend our sincere gratitude to the Columbia Basin Trust for awarding ESIS a technology upgrade grant which has allowed us to purchase new equipment, such as rugged notebooks and server upgrades, in order to serve our subscribers better. Thank You CBT! Wishing all of our subscribers and East Shore residents a lovely Spring! All the best from the ESIS board and staff. Welcome to Autumn in all its glory! This is one of the best times of the year to really dig into projects. 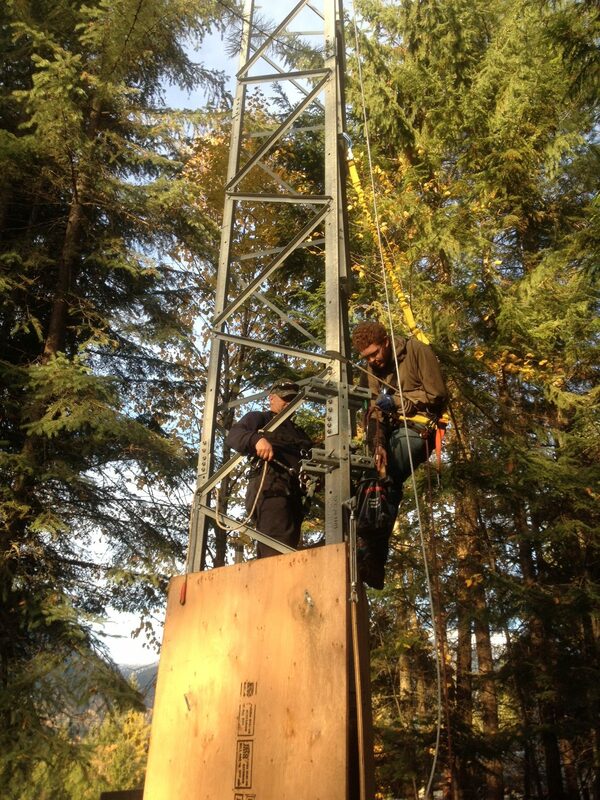 ESIS’ work on the Connecting Canadians project continues apace with a focus this month on completing the Kokanee Springs tower installation. 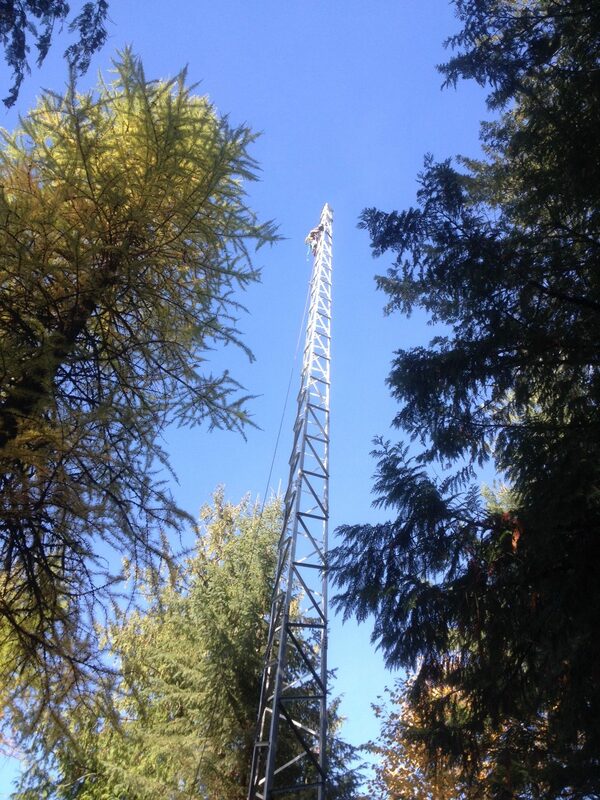 The structure is nearly complete and the next phase of mounting Access Point equipment on the tower is beginning as of this writing! November will bring connectivity upgrades to many subscribers in Crawford Bay. Much Gratitude to Mike Jeffery, Garth Norris, Alex Lackovic and friends for their volunteer efforts and expertise in tower building. ESIS Customer Support has become aware of some phony tech support scammers targeting East Shore residents with telephone calls claiming that your IP address has been copied, or similarly your computer has been identified as compromised, and for a fee these scoundrels will clear-up that problem for you. In fact, if you give access to your computer to one of these callers, it’s quite likely they will install malware rather than remove it, and sometime in the future your computer might pop-up an alert saying once again to call them (and pay them) to solve the problem which they created. If you receive a call similar to this, do not allow access to your computer or arrange to pay money. If you’re not sure what to do, you can call ESIS Customer Support toll-free at 1-844-776-3747 (PRO-ESIS), then press 1. All voicemail messages will be responded to. 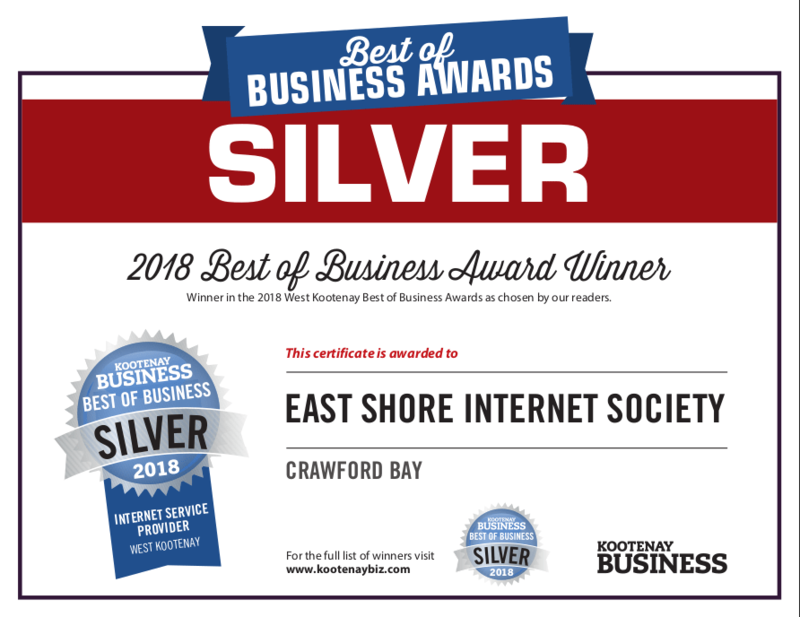 You can also contact us by email at support@eastshoreinternet.ca. Tech-savvy readers may have heard of a recently-detected vulnerability in WiFi enryption, called the KRACK vulnerabillity. This exploits implementation flaws in the WPA2 security protocol used by most WiFi routers. It is a serious issue globally, however the threat level to ESIS subscribers is quite limited. It is an excellent idea to keep your router’s firmware up-to-date, and router vendors are updating their products’ firmware to deal with this issue now. If you have an older router, consider upgrading! In some cases you may notice performance improvements immediately. ESIS stocks new routers from $60 for increased range 802.11n, to $90 for for dual-band 802.11AC. Our technicians can configure it for you and make sure everything works correctly with the ESIS equipment.